old was born with autism, but like any younger sibling, he just wanted to be like his older brother, Dane. Both boys were sports-driven, but Zachary was never given the same opportunities as Dane. Zachary also faced obstacles inside and outside the classroom, including bullies who told him he wasn’t worth anything. Despite these challenges, Zachary never felt he was disadvantaged. He was willing to do whatever it took to reach his goals, many of which revolved around athletics. Zachary first tried participating on typical sports teams, but coaches didn’t have the training or patience to direct Zachary’s talent and energy. It wasn’t until Zachary was in sixth grade that the Fishburns found Special Olympics and the nonprofit’s unified sports program. The Fisburns were grateful to find a sports program that would include and challenge Zachary. 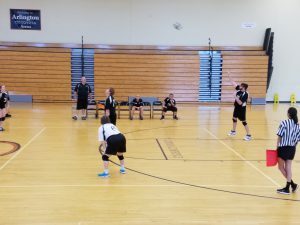 Every week, he and his family travel one hour each way to so he can play on the Clay County unified volleyball team, which includes typical participants and participants with intellectual and developmental differences, or IDDs. The Special Olympics teams are inclusive, but every player, whether they are typical or have an IDD, competes at the same skill level. Zachary’s volleyball team has performed so well that they will travel to Seattle, Wa., in late June to compete in the 2018 Special Olympics’ USA Games. These inclusive efforts align with the Connectablecampaign message, which encourages meaningful interactions between the IDD population and the greater Northeast Florida community. This is Zachary’s second visit to the Special Olympics’ USA Games. He first attended in 2014 to compete in golf.